If you have an expired (within 12 months) or expiring US Visa, you may be able to renew it without having to schedule an interview with the US Embassy. I just got our passports back and ta-da! That’s all via dropbox and it’s super easy! I’ll walk you through how. The last time I applied for a B1/B2 visa it was approved. Be sure to note down your application ID and answer to your secret question so you can retrieve your application should you need to. Fill up the form accurately. The form is lengthy with questions about your travel plans, previous trips, work/educational background, and security checks. Rest if you have to. You can always retrieve the form again and continue where you left off. Supply all the names that you go by. This is especially important if you are going from maiden name to married name and vice versa. Also, if your name has a native character like Ñ, it goes under the field Name in Native Alphabet. Double check all information entered. My computer was set to auto-fill so some of the items it entered were incomplete or incorrect. Make sure to review the information before signing and submitting. Test your photo. At the end of the form is a photo upload tool that lets you check if the photo you are submitting follows their requirements. Take advantage of it so that you’re sure that your photo is acceptable. Once you’ve submitted the form, print the confirmation page. Each applicant must have his/her own form. Follow the link above to get a receipt form, which you will bring to the bank to pay. Payment can be made via BPI deposit or online via Bancnet or BPI Online Banking. Each applicant must have his/her own unique receipt number. The B1/B2 Visa fee is $160 or P8480. Write the applicant’s name and birthday on the upper part of the receipt for the bank to use. The teller will return the lower part of the receipt, do not lose this. If you already have an account from previous applications, simply login with your email address and password. Otherwise, create a new account. Do not create multiple accounts. If the system detects that you have an account with them already, it will ask you to consolidate your accounts and submit your passport for verification. You only need one account per family. I made an account for the husband and then added myself as a dependent. It will need your passport details and your DS-160 confirmation number. There will then be questions about your qualification for the dropbox/interview waiver. You and your dependents must be able to answer YES to all the questions to qualify. There is one question towards the end about no changes in name there that might stop you if you are an applicant with a maiden surname changing to a married surname. I got my old US visa before I got married so it still bears my maiden name. Now that I’m married though, the new visa has to also reflect my married name so it is a change name, right? I actually stopped my application and had to research about it. It turns out that I still qualify because I indicated in my DS-160 form my maiden name as my other name. Whew! – [March 2019 UPDATE]: With the new requirement (Qualification #10 above), those that need to change name will not be eligible for the dropbox. When you’ve answered Yes to everything, you will be led to the Interview Waiver Confirmation Letter. Print this out. ALL Passports since your last US Visa. 2 Recent 2×2 Photos that meet the Photo Requirements. Your application will be returned if the photos submitted are not allowed. You will have to drop it again at a 2GO branch, at no extra charge though. Note: You might want to take photos of your passports and visas, just so you’d have a soft copy, before you send it off. Once you’ve packed all the requirements in Step 4 in an envelope, bring it to any 2GO Express branch near you. You’d be given a form like this. Fill up your name, address, passport number and UID number (the barcode in the Interview Waiver Confirmation Letter). Each applicant has to fill up one form, even if you are applying as a family. The staff will then put your entire envelope in their pouch and send you off with your waybill. You don’t have to pay anything for this. It’s a very quick wait actually. I dropped off ours on Wednesday evening so it was dispatched the next day because it was already after their cut-off time. By Monday, I already received an email and a text message saying that it was already picked up from the US Embassy. It arrived on our doorstep on Tuesday, so that’s just 3 working days. If you will not be there to receive the passports, do make sure to leave a proper authorization letter and ID. 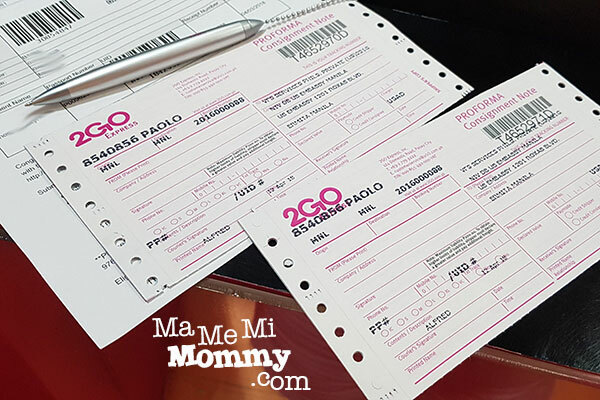 The 2GO personnel was very strict in checking for IDs as they have to note it down in their waybills. Your blog if very helpful. I have same question also.i got ny visa when i was single and now I am married. What was your answer to that question? Was it YES OR NO. Thank you. Thanks for sharing this. My visa is expiring this December and I am qualified for the interview waiver. Do I need to have upcoming travel plans to the US to be able to renew my visa? What if I plan to travel next year, with no definite month and date yet? Thanks! Hi! were you able to renew your visa already? mine expires this month (october) and so I did the whole visa renewal process. My only concern is that my visa waiver letter only wanted me to pass three items, the 2×2 photos, my old passport with the visa and my new passport, and the visa waiver letter. nothing else. No DS160 and no receipt for the visa payment… anyone have the same experience? I just renewed mine. I just sent those three and added a copy of my DS 160. I got my passport after 3 days. 2go just texted me that they were about to deliver my passport within the day. Thanks for sharing this. My US visa is expiring this December and I am qualified for the interview waiver. Do I need to have upcoming travel plans to the US to be able to renew my visa? What if I plan to travel next year, with no definite month yet? Thanks! Hi AC! There are questions in the form pertaining to travel plans. You don’t have to have a definite date etc. A rough estimate is okay. Question! so in your application you already used your married name as your primary name right? where exactly do i have to write “other names that i go by”? in that portion, is that where I write my maiden name? My married name has an Enye, do I write it in my primary name application as Enye or as N? good day sir, I have same situation as you have, If you dont mind what is the result of you inquiryt, drop box or traditional way, thanks. Thank you. Your blog helps a lot. We are a family of four and our visa expires in November. Thanks for the read and advise. God bless you. hello, I went to a 2GO location for drop box of my documents and they are asking a DSL form. Did they ask you that when you drop off your documents? thanks. When you dropped off your documents at a 2Go location, did they ask for a DSL form? Hi Ann, no, I was not asked that form. I remember presenting only the interview waiver and that’s where the staff copied the info from. Your blog really helped me completed my parents Visa renewal. Now i have to take Step 5 and Step 6. Thanks for a well written Blog about this. May your tribe increase. Hi Ms Myla. When you answered no regarding the 10 finger print, did they renew your US visa without the interview? Hi Ms. Myla. When you answered no to the question regarding the 10 finger print, were you able to renew your visa? Thank you. Hello! May I ask what you end up answering? I also don’t recall if I was ten-printed. I assume it won’t affect the illegibility for dropbox/waiver naman right? 🙂 Thanks! I made an account for Step 3 but the Interview Waiver questions did not appear. I was able to provide my DS-160 confirmation number and receipts number but it led me to the visa appointment scheduling, which i did. I’m not sure what to do to go back and be able to see and answer the Visa Waiver questions. At what part did it appear for you? 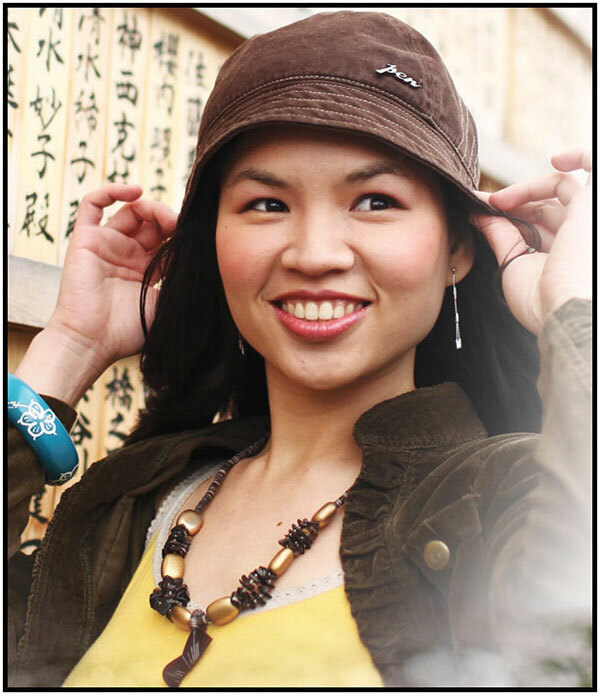 Hi Angelica, after creating my account, I had to provide details like passport number etc. That was also where I put the DS160 confirmation number. The questions should follow that part. I don’t know why you were led to the appointment page instead. Hi Angelica, doing the dropbox visa option for my Mom and its also asks me to schedule an appointment, withouth the visa waiver questions. Were you able to do it? Would really appreciate your help. Thank you. Same situation happened to me. They asked to schedule an appointment without visa waiver questions. What did you guys do? Did you proceed with the appointment at the embassy? Ok thanks ms cheryl. this is for D160 form. Hi! First of all, thank you for this detailed guide. Just a quick question regarding the ten-printed field. This is silly but I really can’t remember if I’ve done it. Got my visa in July 2008 and have been to US twice.. both JFK as port of entry. Is it better to put NO? I read in one forum that it you’ve been to the US after 2007, it’s quite certain that you’ve been ten-printed. Let me know your thoughts. Thanks. Hi, one of the criteria in the ustraveldocs website on this is your name doesn’t have to be corrected or changed in your new visa. Does this mean changing from maiden to married name is not included under this category? Did you fill out your forms with your married name? I got my passport and visa already! yehey. I did not receive an email. 2go just texted that they will be delivering my US visa. Thank you very much for the help😊 it was pretty quick, i went to 2go oct 1. After 3 days (october 4) my passport was delivered back to me. …they did not ask for my DS160 or my receipt for the visa payment. What are the chances that they minimized the list of documents for October 2018? Hmm…I’m not sure. Maybe they have found a way to validate those online so no need ro preaent them. I will have to ask my in law who will submit her application this month. What happen to your in-laws they did submit their bpi receipt and ds160form?and they did get their visas renewed? Hi Mark, they were able to renew their visas successfully. They submitted the same as what I posted above, including the ds160 confirmation page and the proof of payment. I just got my passport back last October 4. I just sent those 3 requirements and added a copy of ds 160 just to be sure hehehe. I got my passport 3 days after i dropped it off at 2go. I also did not receive an email nor a text from the embassy. But I got a text from 2go that they were about to deliver my passport within the day. Hi! I just received my confirmation letter as well and they requested the same, 3 things. Should we still include the DS 160 and the bank payment slip? Pls help! i had dropped mine off on a saturday so there’s not enough update on it (its still sunday night). Anyway, one question, did your parcel say 221G package on it? The woman behind the 2GO counter didnt seem to know what she was doing, and she didnt even ask for my IUD code which I thought was odd. Pls tell me its just me and mu anxious self and that other people have the same experience….??? Hi Ma’am, this is very helpful. Thank you for writing this. May I clarify if is better to pay the application fee first before completing ds-160 form ? In this website http://www.ustraveldocs.com/ph/ph-niv-visarenew.asp , steps listed but step 1 says to pay the application fee first. Ma’am thank you for your prompt reply. I was trying to fill out DS-160 form and I’m not sure if have done Ten printed before. My b1/b2 multiple entry visa got approved dec 2007 which was 11yrs ago so I can’t recall if it was 2 fingerprint or 10 fingers when went to the consulate. I wonder when did the Ten printed started . After my visa approved Dec 2007, My first and last vist to US is Jan 2008. I cannot recall if I did that in the immigration. Do you think that process was already in effect last 2008? So sorry, it was 10 yrs ago so I cant figure out what to answer really in the application form if i did Ten printed. Hi. I am renewing my visa under my maiden name to my married name, should I answer yes or no? Hi. I didn’t place my maiden name as an other name in my Ds form. Will that be okay pa? I cant edit naaa 🙁 and if that so, will i be answeing yes or no sa change name? Hi Marnee, are you sure you did not put your maiden name anywhere in the DS160 form? If not, it might be safer to not use dropbox. Just my 2 cents. Hi po Ms. Cheryl, very helpful blog, thank you for posting! My question po is regarding Item 9 of the qualifications “The last time I applied for a B1/B2 visa it was approved.” I applied for the first time in 2009 and got approved. Does the requirement mean that I was approved at least twice, before I can apply for the Interview Waiver Program? The words “last time” baffles me because it was my first application and was approved; and my interpretation is that for example: 1st application was denied then 2nd time, approved, hence “last time”? Was it your first time renewing too? Or you know of a similar scenario as mine? Hi Angel, it only means your previous application, regardless of whether first time or nth time. 🙂 So with you, you definitely qualify for the dropbox for that question. Thank you very much po! About to lodge my application and I’m just hoping for the best!God bless! hello , we traveled to the US when my daughters were only 8 and 12 years old. Are they qualified for an interview waiver or do they need to go to the US Embassy in person to apply for a visa renewal? Hi Edith, one of the requirements is for the most recent visa to be issued or after 14th birthday so that means your kids have to apply in person for visa renewal. Hello, Thank you so much for this blog! It’s so informative, well written and very helpful!! I’m planning of using this service to renew my US visa. But I can’t remember if I have an old account or which email add I used. My hubby created an account and got his visa recently. Should I use his account and put myself as dependent? I’m the only one renewing the visa. Or would it be better if I create my own account? Hello! Thank you for this well written, informative and very helpful blog! I want to renew my visa using this service too. I cant remember if I have an account already or what email add I used before; but my husband has one since he got his visa a year ago. Should I make a new account or put myself as dependent undermt hubby’s account? Thanks! Hi Cheryl ,will they be asked if what is their purpose of renewing the visa? Thank you for your response. Hi Edith, yes, it’s likely to be asked. How many years they will give you in applying for u.s.visa renewal? Hi Arlene, the visa you mean? We got 10 years validity. Can I still include my daughter if she was still 5 years old at the time her last visa was issued and I want to include her now since our visa will be expiring April 2019? I would appreciate your reply.Thank you. Hi Carljohn, the qualifications are for each applicant so I think it’s a No for her. I just applied for renewal via Dropbox early this week & I would just like to ask if the email or txt msg you received from the us embassy stated that your visa was approved. In my case, i got an email this afternoon that my documents have been collected from the us embassy & the passport number being returned is ****** while the txt msg stated that my passport ****** is ready for pick up. When I checked my status at ceac, is says Issued. Does it mean that my visa renewal via Dropbox was approved? Ok, I do hope so coz I’m really anxious what the result is that’s why I decided to ask you. Thank you for replying! Im not used to asking online so I just want to ask if u received my previous comment? Hi Lance, I’m not sure about that as I’ve only applied for b1/b2 visa only. I think it’s best to call and ask the embassy about it. Hi Monica, the interview date is applicable only for those who will go to the embassy. It should not be related to the sending of documents. I sent mine about a day or 2 after I got the confirmation letter. I suppose a day or 2 is fine. Just don’t wait till like a month before you send in the docs. Great. Thanks! This blog is very helpful. Hi! I just want to clarify this part “My most recent visa was issued on or after my 14th birthday.” What if my visa was issued on the year that I will be 14 does that apply for interview waiver? barcode confirmation is in the ds160 form. after following this blog, i now have my multiple entry visa renewed. This is really helpful and very informative. I followed your advice, placed my maiden name on the “other names” section and then answered yes to all the questions. I got the Interview Waiver Letter and dropped it in my local 2go, but i got a letter back, like a checklist type, that said i needed to change my name so i did not qualify for an interview waiver. Has anyone else had this experience? I renewed mine this october after reading your blog. Im wondering what i did wrong, ive done the 10 fingerprint, been to the US and back 4 or 5 times. Everything checked out except for my name change. I live all the way in CDO and dont really have time to fly to manila so this was such a dealbreaker for me..
Hi Antonina, I’m so sorry to hear about this. Hmmm…I wonder what went wrong. I hope the others can also share their experience. Hi sorry with the rejection letter did they give back the passport… i got an email this morning stating that a case regarding my application has been created and reason is did not meet IWP requirement so guess mine was also rejected. I also followed steps i wrote may maiden name also. Hi! Yes i received my old passport and recent passport in the mail with the lettwr stating that i did not qualify for an interview waiver due to the name change and that i needed to come into the embassy for interview. Hi Antonina! If you don’t mind me asking, how did you proceed after they sent you that letter? I am also about to renew my US visa but with changes from maiden to married name. I am thinking of using the Dropbox, however with the stated problems encountered here, I am having second thoughts. Thank you in advance! Hi RZ! You should still try the dropbox first, I don’t think there will be any problem, it seems that some get thru and some dont. I just need to pick a date for my interview, but I haven’t done that yet since I am all the way out here in cagayan de oro and do not have time to go to Manile for an interview. I’ve put it on hold for now and so everytime I log in it just tells me the earliest time I can go in for Interview. Hi Meann! Did you go in for interview already? I wasn’t qualified for interview waiver also due to name change. If it’s alright with you, can tou pls share how it went? Thank you so much and happy new year! Hi! 🙂 You were right! It was just a delay in the posting of the payment. 🙂 The next morning (last friday – Nov 23), i tried to input our reference numbers and it was accepted! Just an update lang po, my US visa was renewed under the Interview Waiver Program for another 10 years! Dropped it in 2go on 13 November 2018, US embassy received the next day (I assume) and the US embassy’s issuance date appearing on my visa was a Friday (November 16, 2018)! I received my passport November 20, 2018. I just tried using dropbox last week and they returned my application stating that I’m not qualified for the Interview Waiver program because of my name change due to marriage. Unfortunately the same thing happened to me. My US visa was up until oct27 and i had renewed it a week before. I dont know if that changes the outcome. But im more relieved to see that there are a few of us here who weren’t qualified, as it means that it was nothing that we did, but due to name change lang talaga. Did you renew youre recently? Mine was this october 2018..
My visa expired December 4, 2017. Can I tenew it? The application will ask if you have a visa that is still valid or already expired within the last 6-12 months. I think the timeframe is only up to a year. Since it’s already a few days past December 4, i think they will most likely ask you to re-apply for a new visa, and not a renewal. Just my 2cent. Please feel free to update us here on your visa process and God bless you! Maybe they became stricter na now… i just mailed mine last week but my visa expired last dec 12, 2017 pero pasok pa ako sa 12 month time frame. Hassle lang for us i was hoping they would allow na since kita nman talaga sa passport na change name due to change of status. Hi Leon, you can already renew it by feb 2019. It’s not too early. 🙂 As for your first question, I don’t think it will be a cause for denial as long as you don’t overstay. My aunt used to do that until she finally got her petition ok’ed. Hi Cheryl, good day. My family of 4 plan to apply visa through drop box. But my youngest daughter isn’t qualified since she had her visa granted when she was 12. Would you recommend us to apply the traditional way as family or the 3 of us can apply through drop box and my youngest daughter will apply separately through traditional way? Thanks. Very helpful blog. I have a question though. Where did you put your middle name (i.e. your mother’s last name)? Did you include it in Surname or Given Name? Hi Cat2x, I don’t think I included my mother’s last name anywhere in the name as I am married already. Hi! For future reference and based on my personal experience, you are supposed to put your middle name after, and as part of your first name. Say your middle name is “Santos”. You are supposed to enter; SURNAME: Reyes GIVEN NAME: KATRINA SANTOS. I made the mistake of only putting my First name and Surname, leaving out my middle name. I did this for my US visa renewal via dropbox. I was super nervous to be called personally for clarification, but I guess I got lucky because my US visa got renewed after 1 business day. It got delivered the next day. For the married women here, another thing I want to add is, if you do not mind NOT changing your surname, then I encourage you to keep it. My old US visa was under my maiden name. I decided not to change the name in my passport because I already had a lot of travel records and visas under my maiden name. Most importantly, this made me still eligible for the dropbox renewal via 2Go, as I did not need to “change name”. It saved me the hassle of going personally to the embassy to prove that I am the same person. Just would like to share some of what i have learned, cause i also encountered similar problems as others. #1. The interview waiver questions didnt come out and was lead to set an appointment at the embassy. Solution is to make sure that you chose the B1/B2 visa. My mistake was i just placed B2 only so that directly lead me to set an appointment. Hi tisha! Question lang po, so did you end up going to the embassy for interview? Did they ask why you made mistakes filling up the application forms? Hi Antonina, are you already done with your interview? How did it go? Were you able to renew your US VISA. 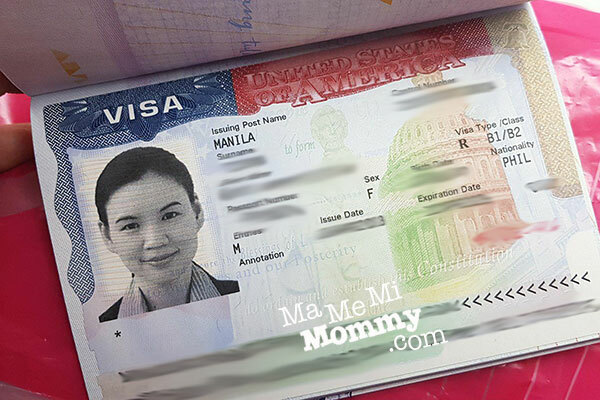 My visa will expire this Feb. 19, 2019 and my visa is still in my maiden name. Will I be qualified for Interveiw waiver program? My name, date of birth and gender on my last B1/B2 visa do not need to be changed or corrected. Hi Nicole, I used Chrome on Mac. Maybe you can try restarting your computer. Hi! I just filled out a DS-160 form and noticed some questions were no longer in it: definite travel plans, previous work experience, other countries visited etc. I assume they have updated the form as of 2019? Would appreciate hearing from those who recently applied and if these questions were in fact excluded just recently. Thank you! Security and Background from Part 1 to 5. Hi Karen and Leon, I also asked my SIL who just completed her application form recently and she said there are those questions about travel plans, etc. Thanks for your reply. Iam wondering why karen her ds-160 doesnt have a questions like working experience, travel plans etc. But mine has. I dont know if my browser is wrong or not. Is it true that they updated the questions in ds-160 form? Hi! There are still those questions about travel plans to US, employment, security etc. but what I noticed that changed were: no more questions on other countries visited OTHER than the US, PREVIOUS employment, secondary educational attainment and above as well as on definite plans to the US. I remember in the forms before there used to be such. Anyway, as long as we’re using the correct link in filling out the DS-160 I guess it shouldn’t cause an alarm. Good luck to us! Hi! Nope, hindi siya employed. He just finished his post graduate internship as a doctor at that time kaya wala rin siyang work. They just asked for his educational history. They didn’t ask na rin for any documentation from my parents, i indicated na sila ang mag sponsor ng trip niya. Hope this helps. Salamat po ng marami…ask ko kang po kung ok po ba ilagay na yung brother ko po ang mag soonsor ng trip ko kung safe ba yun kasi sya naman talaga ang mag babayad although i have work here…sana ndi redflag sa kanila..any reply po makakatulong..salamat po in advance.. I think it’s best to answer as truthfully as you can. 🙂 Just make sure you have strong ties to the Philippines and i think you’ll be okay. Maraming maraming salamat po sa mga sagot po ninyo naliliwanagan na po ako. May tanung lang po ako before i proceed sa application ko. Nakailang travel po ba kayo nuon sa loob ng 10yrs visa po ninyo and how long po yung stay po ninyo duon kada punta po ninyo o kahit yung mga sa kapatid po ninyo na naapprove thru dropbox. Sana po masagot po ninyo pasensya na po sobrang kinakabahan lang po ako. Salamat po in advance kung masasagot po ninyo malaking tulong po yung sagot po ninyo. Thank you for this article, Cheryl! I applied last Tuesday, got my passport and visa last Saturday!!!! Just follow the instructions hindi kayo magkakamali. Btw, before kayo pumunta sa 2GoExpress baka gusto nyong tumawag muna sa branch na pupuntahan nyo kasi yung iba hindi nila alam ang tungkol sa US Visa application. 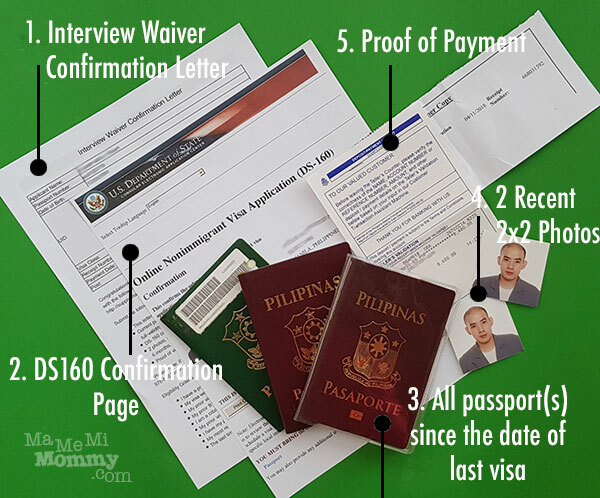 Congratulations po…May i ask po yung 10 years validity po ninyo nung last visa po ninyo how many times po kayo nag travel sa US and every alis po ninyo how long you stay?Makakatulong po ng malaki mam pag nagreply po kayo maraming salamat po ulit. Hi Maricar! question lang po, when you applied for a visa renewal, did you need your name changed from maiden name to married name? were you able to do everything via dropbox? when did you apply? I did mine last october 2018 and was told that I’m not eligible for interview waiver due to name change. I haven’t picked a date yet for my interview, i have not had time and don’t really know when I’ll be able to take off for manila just for an interview, its super hassle…. please let me know as I am trying to piece the puzzles why I got rejected and some go thru, thank you! Hi Antonina, singit ako. It seems that they have updated their new qualifications, which in effect disallows the married name change to renew via dropbox. On another note, I have scheduled an interview for my toddler and the earliest I got was on June already. Hi Leon, if there’s a possibility of you finding a more permanent job within the year then maybe you can delay your application until then. Para mas sure 🙂 pwede pa naman yung dropbox within a year after expiry. So till Sep 2019 pa. Mahal nga din kasi ang visa fee so nakakahinayang if hindi maapprove. Sa form kasi they ask details about your employment. So lahat dun mo ilalagay. Since dropbox, you don’t include any supporting documents din sa pagsubmit. Everything is in the form so try mo muna fillup yung form to see if may mga questionable info ka. No need to pay pa naman to answer it. Cheryl whats the link for the website to renew US visa where DS 160 form is ? Hi Alik, it’s in the post, the step 1 heading, there’s a link there. Hi Cheryl, I will be renewing my US Visa but also with the same situation as yours, maiden to married name. I wanted to be qualified for the dropbox program para no hassle na to interview pa.
Was this criteria included when you renew your visa? Hi Carmela, I checked back on their website and that is an additional criterion. Although that same question appeared at the end where I answered Yes to all questions for dropbox eligibility when I applied. I suppose they are stricter now so they added it in front. My friend suggested me to visit this blog before i renew my US tourist VISA through drop box. I have a 10 years US Visitor Visa my visa was issued Last August 2008. and i am planning to visit US again this May 2019. during my 10 years valid visa i almost traveled 5 times and stay at US almost 6 mos, every visit. My last visit was August and back here last February 2018, i never overstayed. My father (US CITIZEN) will be here in the Philippines to attend for the graduation of his grandson and be back to US this May 2019. My father is already 72 years old. The family decided me to accompany my father going back to US this May 2019. 1. Is it good to declare in DS160 im travelling with my father going back to US this 2019? 3. Grounds po ba ng denial to renew my US tourist visa ang stay ko ng matagal sa US at yung frequent ko pag punta po duon ng 5 times at stay there every visit ay 6 mos? 4. Ok po ba na pumunta ako this May 2019 eh kakauwi ko lang ng Feb 2018? Sana po masagot po if not kahit po sino para po ma enlighten po ako maraming salamat po in advance. We’re on the same boat. I think Ms. Cheryl can answer your questions. Iam hesitant to renew my visa because my last travel was march 2018. Is it ok Ms. Cheryl that i will not declare my plan to visit in US in ds-160 i just want to renew it. Thanks also in advance. 1. You can choose not to say this as travel plans can be an estimate and not definite naman. 3. Baka hindi naman, as long as you did not overstay. 4. Seems ok if frequent traveller talaga. I hope I was able to help somehow. 🙂 Best of luck in your application! I just want to ask your expertise on this, my friend has a travel agency and they offer the service like this renewal thru drop box is it safe if i avail their service?but i think it is too expensive mga 5K daw po ang fee nila. baka po kasi mag kamali sila ng fillup at dun pa ako madeny. If you can, I suggest you do it by yourself. It’ll save you the money and you’re more confident with your own answers. Fill up the form first. You can proceed paying after filling it up, before submitting it. Interview waiver is 3rd step pa, as seen on the blog post. Ask ko lang po if nakailang travel na po kayo sa US sa loob ng 10years visa po ninyo at how long po kayo nag stay sa US. Sana po kahit yung iba pwedeng sumagot lalo na yung na approve na visa for dropbox. Hi Mark, madalang akin e. It was like mga 4 or 5x in 10 years and mga 2 to 3 weeks ang stay. OMG 😮 parang kinabahan na ako mag renew ako kasi tuwing punta ko duon ill stay 5mos and even 6mos pero hindi naman ako nag oover stay. Sana may mag comment dto ng parehas ng ginawa ko at na approve sila. Ms. Cheryl may kamaganak po ba kayo sa US?me kasi dad ko and bro ko kaya andun ako ng matagal. Thanks po pala sa sagot po ninyo Ms. Cheryl. Sana po masagot po ninyo yung ffup querry ko or kahit sino po pwedeng sumagot ng parehas ng ginawa ko na stay 5 mos or 6 mos tapos nakapag renew sila ng visa nila through dropbox without interview. Thanks in advance. Hi Mark, my aunt does the same thing. She stays in US for a long time but comes home before she overstays. This is because her daughter is there in the US. She’ll be applying for US citizenship na though so hindi ko matanong if magdropbox siya. Basta naman hindi ka nag ooverstay dun and you have sufficient funds/work here, I suppose you’re okay. Sana yung iba makapag share din inaantay ko si Sir Leon kasi parang parehas kami ng case. Yes i have work since 2010 but yjng sweldo ko ay 18k lang per mos. siguro naman marerenew namn nila yung visa ko through dropbox. Kaya nag search muna ako ng mga blog baka may mabasa ako na katulad ko rin ang case bago ako mag apply mahirap kasi ma deny kasi dadaanan ka nnmn sa butas mg karayum ☹️. Im always checking your blog, kung merun na nakatulad ko na nag file at na approve, until now wla pa.
Ms. Cheryl, ask ko lang po ulit saan po pala ilalagay yung middle name kasi ang nakalagay lang po sa DS160 surname and First name. Salamat po ulit ng marami. Hi Mark, if hindi naman inask yung middle name then no need to supply it. FIRST NAME yung sayo ba saan mo nilagay yung middle name mo? I forgot na the fields sa form. Wala bang field na middle name? Or name as it appears in passport or something like that. Ako kasi since nagchange ako from maiden to married name, nilagay ko sa other name yung full maiden name ko. I think there’s no need to include middle name in the first name field… just purely first name. Got my visa as applied, no middle name in my DS-160 but in the actual visa given name/s would include middle name. Hope this helps. Welcome Max! 🙂 Good luck on your application! did u renew your visa? hi guys any update?? ?wala pa ding nag rereply hayyy sana may update nmn..thanks po ulit. My cousins and I usually go to US together because his mom and my mom ang siblings. In Short kada umaalis ako kasama sya pero iba sya sa pila kapag andun na kami sa port of entry. Anyway, we have 10 years visa granted last 2008, and nag expire na sya since one of the qualifications for dropbox is ok naman pag expire na ang VISA mo kaso hindi dapat lalagpas ng 1year since we got our visa Last September 2008 so bali mga September 2019 pwede pa kami mag renew through dropbox. Kada alis namin nag stay kami ng 5 to 6 mos kasi nga pag entry naming duon ay tinatatakan kami ng 6 mos validity of stay syempre sinasagad na naming, siguro mga naka 5 times kami bumiyahe papunta US, but we never overstay kasi illegal yun. Ngaun nag decide kami na mag renew at nagusap kami na sino mauuna, nauna ang cousin ko mag renew Feb 2019 through dropbox kaya nag send sya ng papeles nya sa 2Go the usual process. Pero after 4 days he receives an email from the US embassy na kailngan nya mag appear sa US embassy for interview. Pumunta sya sa US embassy. Ang tanung daw ay bakit daw matagal sya mag stay sa America kung may work sya dto, may work ang pinsan ko isa syang manager sa kilalang bangko dto sa pinas kahit I check nila ang employment nya at yung mga SSS or something. Ang sinabi nya ay upon entry tinatakan sya ng 6 mos. That’s why he use it to spend quality time for his mom. Tapos walang double check sabay abot ng passport sorry you cant get a VISA right now. So ayun, nag taka sya bakit ganun eh may work naman sya kahit I check nila. Siguro nga na silip yung tagal nya sa America ng stay siguro every two years sya pumunta sa US kasi sinabi nya na earn nya ang leave nya every 2 years that’s why he stays 5 to 6 mos, yun pa pala ang reason nya. Well anyway, sinabi nya sa akin yun kaya ako hindi muna ako magrerenew kasi nga ang sabi is using dropbox for renewal it doesn’t mean na mapprove agad ang visa mo. Ang hinala namin kapag dropbox ka dapat ang stay mo lang is halos mga 2 mos hindi lalagpas duon kung ganun ang case nyo ok kayo sa drop box, pero kung matagal kayo sa states I suggest wag na muna kayo mag apply or u will under the usual process pahinga lang muna mga 5 years kasi baka yun ang red flag sa kanila na nag mamadali ka mag renew agada gad eh kapupunta mol ang ng US last 2017?eh ano pakialam nila eh kaya nga renewal db?mahirap pa nmn ma deny kasi may record na sila for denial sabi ng pinsan ko mag aaply ulit sya after mga 3 years or so. Un lang saying yung pera na binayad nya. Anyway, I rest my case now, atleast alam ko na kaya antay nalang ako bago mag renew kasi sya deny for sure ako din hahahha. May nakausap din sya duon na for renewal through dropbox, maingat din sila sa mga nag palit ng maiden or surnames pag nagrerenew kasi siguro daw yung iba baka duon gusto manganak sa US mga gunggong ang utak hahahha. Pasensya na masyadong mahaba na. share ko lang ito para makatulong sa inyo guys. No problem Ms. Cheryl basta makatulong sa iba kasi kahirap din pag walang alam tapos bgla mag aaply ng dropbox. Parang ang hirap kumuha mag renew ngaun pag mahaba ang stay mo sa US kahit na valid ung stay, at yung mga nag change or kinasal mahirap din kasi ang mga gungong na consul nag iisip sila baka duon iluwal ang bata. Mabuti na save ko ang money ko at time mahirap kasi ka deny kasi kay record na sila once denied na, kaya ayun na save ang application ko ng pinsan ko. And mark try to read and analyze para malaman mo goodluck kung itutuloy mo ung application mo pero ako i dont want to take the risk. Thanks again guys. Hi..thanks for the information. I was thinking of the same thing din baka ma deny ako. I am about to renew my visa and the grace period is until May 9, 2019 para mag 12 months na sya. So I am still qualified for the drop box right? About my stay in the US, I seldom go to the US. The first one was I stayed 5 months in 2009, then 1 month in 2010 and the last time I was in the US was in 2013 pa. I’m not sure if I would suffer the same ordeal and I hope not since I seldom go to the US and take the opportunity to stay longer. What do you think is my chance for visa approval if this is the case? Right now I only have a 10 month old business and did not have any employment record. Thank you and I hope you can answer my questions too. regards! Just try your luck. Since hindi ka nmn matagal Mag stay sa US?kasi ang hirap ksi db kapag asa port of entry na tayo nag stamp sila ng six month validity ng stay?kaya tayo nmn nag stay ng ganun kasi bawal i overstay. Kasi kapag renewal talaga thru dropbox it doesnt mean na maapprove ka they will call u for personal interview pag may nakita sila na red flag. Try your luck may buss ka nmn and pag tinanung lang nmn if incase yun sabihin mo sa consul pag pinatawag ka for personal interview. And give us updatr ko nakapag file kna at hindi ka pinatawag for personal interview….ingat and regards. If need more info just dont hesitate to reply. Thank you so much for this step-by-step process in US visa dropbox renewal. My mom got her visa renewed after 5 working days. This is very helpful. Thanks again. Hi Cheryl, you gave an update that as of March 2019 ‘With the new requirement (Qualification #10 above), those that need to change name will not be eligible for the dropbox.” Does this mean that even if the name change is from maiden name to married name, its no longer eligible for dropbox application? Hello! Your entry is very useful and helpful. I was just wondering if you’d be able to help me on this — My FIL is applying for his visa renewal via Dropbox. When he created his account, there were no qualification questions asked. He can’t seem to find the page/link where he will be asked the questions for eligibility for dropbox. 😦 I was hoping you have any ideas on this? Hi Katherine, it should be on the CGI portal part where you schedule a new application. After entering the passport details, you should reach the questions for eligibility. Hi Cheryl. We are already in step 3 of the application process. Six of us all family members are applying for visa renewal drop box type. The 6 of us are applying together. All 6 have individual ds numbers and individual receipt numbers. These 6 people are, our mother, myself, my eldest sister, my second sister, my niece and my brother in law. My question is, in step 3 (cgi federal) should we click the add by name, which appears in step 6 of the cgi federal form? or proceed as individual? Hope you can help. Thanks. Ms Cheryl thanks for your immediate reply. My next question is after submitting the cgi federal, will we receive the drop box confirmation waiver letter on the same day? If you ALL qualify for the dropbox then you’d be directed to it at the end of the application (in cgi). Hi Nyra, what we usually do is per family, like one family (dad, mom, kids), one application. I think ok lang din naman isabay even if married na kayo. Hi Janel, if you’ll be renewing via dropbox then those are all the docs that you will need. I’m not sure about your question about Guam. I’m thinking yes.